For more than 20 years, the Mathematics Department at AHS awarded an annual scholarship to a student who excelled in math and who would be studying in a mathematics related field in college. The scholarship fund has grown through donations from former students, colleagues, friends, and family of two outstanding members of the mathematics department, Bill Carli and Dave Cowan. Dave Cowan began teaching in 1954 at Stanton Jr. High, later moving to the high school to chair the mathematics department. He was a motivator and he counseled students about their future plans by sharing his thoughts about opportunities available to them. His positive impact did not stop at the student level. Dave mentored new teachers, offering advice, friendship and a listening ear to their concerns. He shared his experiences and encouraged them to become better teachers through the educational opportunities available. He advocated involvement in local state and national educational organizations. Dave was only 46 when he died in 1978, but his impact on both students and fellow teachers is remembered fondly. Bill Carli ’65 took Dave’s advice about furthering creative ways of teaching students. He became a self-taught computer programming teacher, sharing his projects and strategies with other teachers at local, state and national meetings. Several of his projects were published in trade magazines. In later years, Bill took on the challenge of becoming a mentor to teachers throughout Stark County. He was the school system’s math coach for the high school and middle school and he taught demonstration classes. His patience, expertise and experience were evident as he encouraged students to extend themselves to achieve in mathematics. Bill’s untimely death in 2008 is still felt by many students and teachers, and he is missed. 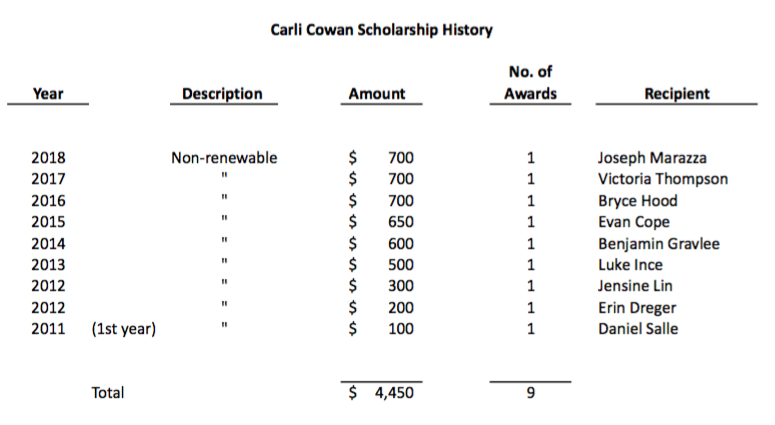 In 2011 the Mathematics Department at AHS chose the Alliance High School Foundation to administer the endowment funds for their newly named Carli - Cowan Memorial Scholarship. The Math Department will continue to select the annual recipient of the scholarship for continuing his/her education in a mathematics related field.